External files and flash drives are used to backup your data and for data transport. So, space utilization is a very important issue. Often needless service junk are generated by Windows or Mac OS, such as .DS_Store, Thumbs.db, .Spotlight, hidden trashes and so on. These files take up valuable space, creates fragmentation and slows down drive performance. 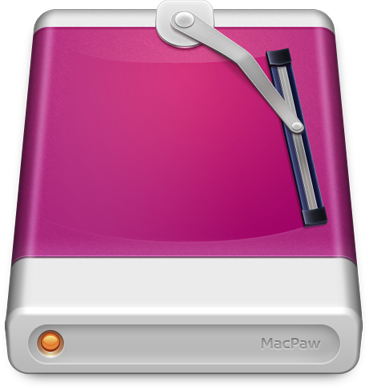 CleanMyDrive is a Free software for Macintosh from MacPaw that cleans junk in thumb drives, memory cards and external HDDs. It also helps you access all your available drives within one menu. Access all inserted external storage within the single menu of CleanMyDrive through a button in the menu bar. 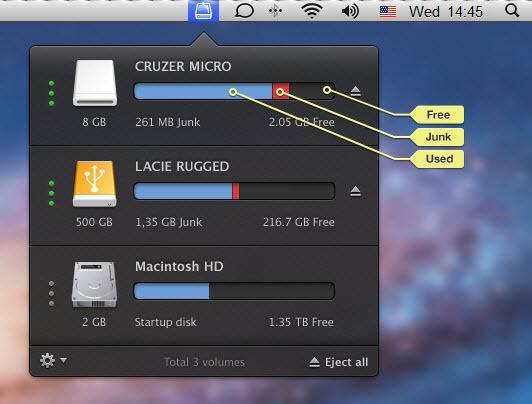 The software offers visual indication about the free, used and junk space in each drive. You can manually clean junk in individual drives with CleanMyDrive. It is possible to automatically remove junk from external storage during ejection. CleanMyDrive allows to eject buttons on individual external storage drives; also an all in one button to eject all storage drives at once. It allows to ignore particular drives. No harm done to files or folders thanks to sophisticated secure algorithms of CleanMyDrive. CleanMyDrive is available for download from Mac App Store. The latest version 1.0.2 installer (4.5 Mb) was released on July 06, 2012. It requires 5.8 MB of free space for installation. It can be installed on OS X 10.7 or later with 64-bit processor. CleanMyDrive is a free software for Macintosh. Use 100% space on your external storage for backing up and transporting your important files. I wish MacPaw will release such a software for windows some day. This entry was posted in Free, Macintosh, OS Maintenance, Software and tagged Junk Cleanup.